Free expression, weight loss, and education for African immigrants were all highlighted at this semester’s BC Talks. 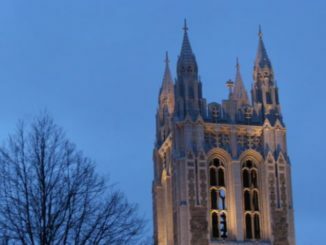 Modeled after TED Talks, the event was held Sunday night and featured eight Boston College students who were each given 20 minutes and an open platform to discuss issues that were important to them. Monica Coscia, MCAS ’17, started her talk, “The Deafening Silence: Repression of Free Expression at Universities,” with an introductory quote that set the tone for her speech. “I disagree with what you say, but I will defend to the death your right to say it,” Coscia said, quoting Evelyn Beatrice Hall. Coscia discussed the presence of free speech on BC’s campus. She referred to the Supreme Court case Tinker v. Des Moines, and highlighted the constitutional rights of students in public schools to free speech. “Free speech is seen the same as violence, to suppress and fear it,” Coscia said. She challenged the audience to break the silence on issues at BC like the Demonstration Policy and Posting Policy, and to look at the movements UGBC is pushing to change these issues. Then, Oladapo spoke about her journey to lose 70 pounds the summer before coming to BC and her mindset and reasoning while losing the weight. She gave three reasons that she originally tried to lose the weight: to be desirable, to stop being bullied, and to satisfy others. Once she came back to BC she gained back more than what she lost. Oladapo realized that her reasoning for losing the weight was superficial. She kept referring to her “destination happiness.” Now, Oladapo focuses on ignoring society’s mold for women. “If you don’t start in the now, you can never hate yourself to love yourself,” she said. Shalin Mehta, CSOM ’16, began his talk, “Your Network is your Net Worth: Cultivating Relationships and Discerning Your Passion,” by focusing on how everything revolves around relationships. He outlined four major takeaways that he has discovered in developing networks. First, your network is your net worth. Money, grades, and status come and go while relationships are constant. Second, it is never too early to begin making connections, and it will take time. Third, people should ask for help when it comes to relationships. By breaking down the walls of being too proud or too shy, one can develop their strongest self through networks with others. Additionally, Mehta gave the example of The Law of 33 Percent—how 1/3 of every person’s time needs to be spent with mentors, peers, and mentees. “Find those who enable you, and be someone to enable others,” Mehta said, leaving the audience with these final thoughts. Rob Mudge, CSOM ’16, started his talk, “A Reflection On Reflection: Why a Jesuit Education Places So Much Importance On Self Introspection,” with the audience taking part in an examen reflection. Mudge highlighted how programs at BC use reflection as a way to focus on what each program provides. By understanding its Jesuit Catholic identity, students at use reflection in activities and groups that aren’t necessarily religious, but choose to look at how to answer the “why,” Mudge said. He asked the audience to see how the St. Ignatius statue on campus depicts St. Ignatius as a pilgrim, not as a saint. He was on a journey, and every journey takes time, Mudge said. Finally, Mudge focused on comparing two types of people, and asked the audience members to see themselves as the pilgrims. “HOOPs!,” a talk given by Teresa Schwarz, Vienna University ’17, was named after the program that stands for Helping Overcome Obstacles in Peru and seeks to guide those in Peru through a specialized program. In Flora Tristán, Peru, HOOPPeru tries to alleviate the cycle of poverty in the town through child education, adult education, health and social work. Some of the lessons discussed were “you can’t do it alone,” “lead the development,” and “be flexible!” Schwarz focused on explaining to the audience her path to cofounding this NGO and her experience working in Peru. James Kale II, LSOE ’16, discussed how the achievement gap in the United States needs to be defined and looked at with educational measures in his talk, “The Lagging Duckling: Opportunity in the African Diaspora.” Kale focused on how there is a direct link between education and self-identity. “A strong sense of self-identification helps someone lead to who they are, through connection with others,” Kale said. He highlighted how second- and third-generation immigrants of African descent decline in education as they assimilate to American culture. “Opportunity is now here,” Kale said, encouraging the audience to act now. Christopher Keegan, CSOM ’18 talked about his ADHD and how that has affected him in his lifetime and his journey to BC in his talk, “Time and a Half in Time.” He focused on the disorder itself, by highlighting its terms and the connotations of the deficit. By breaking down the label, Keegan drew attention to how in society we’ve created someone who doesn’t fit into a mold and is put aside. Keegan also explained the distinction between involuntary and voluntary attention, as well as what each means. Finally, he spoke about his journey in school to understanding his acknowledgement of his ADHD and how he has to deal with peers and friends who looked at ADHD as an advantage in a higher-level academic environment due to abuse of ADHD medication such as Adderall. Lucas Allen, MCAS ’16, delivered the thesis of his speech, “Pandemic under Patent: How Brazil Broke the Rules to Change HIV/AIDS,” by breaking down the use of patents in the pharmaceutical world. After his six-month study abroad in Rio de Janeiro, Allen saw how Brazil approached the HIV/AIDs pandemic by administering free and equal access to treat those with the disease. He then challenged the audience to imagine what a world would look like where health is a human right. We are far from that type of lifestyle, Allen said, but challenged the audience to look at how patents are used. “Do we really need patents for innovation?” Allen asked.